The sun shone once while we were in the Czech Republic and we took advantage of it, skiing up out of the forests on Saturday to a network of trails that stretches out over the ridges of the Krkonose Mountains. 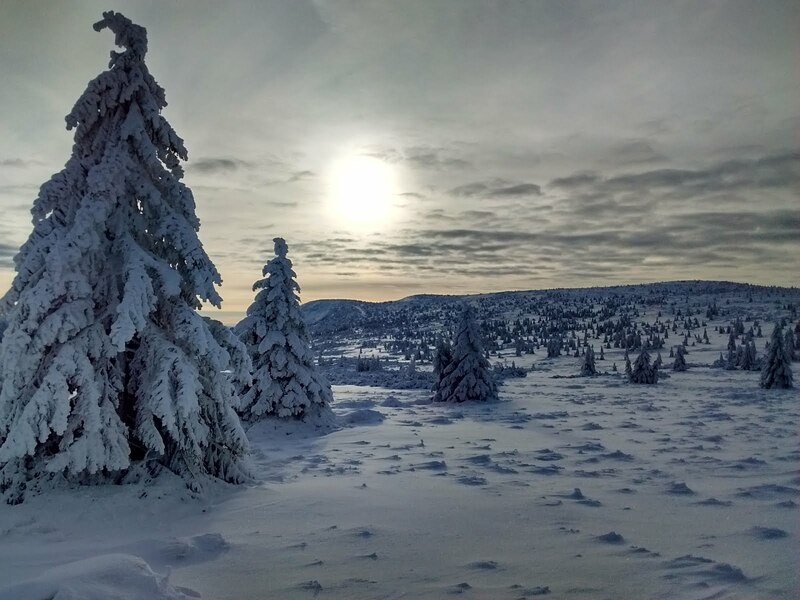 This region is covered with snow and dotted with brush and small pine trees, which bend under the weight of the snow and give the landscape a Dr. Suess feel. After exploring the area for about an hour, we found a map that told us we were only 2 kilometers from the Polish border. Of course we had to cross it. 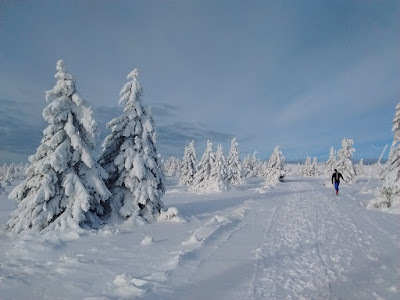 Although no signs celebrated our monumental achievement (at least none we could understand), Tyler’s GPS track of the workout confirmed our international skiing experience. While the two and a half hour ski was longer than a traditional pre-race workout, we both felt it was our favorite ski of the trip so far. On the way to Poland. About as much sun as we've seen so far. Our view from the Stocek's apartment in Horni Misecky. The houses on the right get closer to the road as it recedes, giving the whole neighborhood a view of Jilemnice's center. We arrived in Bedrichov early on Saturday in order to watch the Elite wave, which started at 9:00. At this point, headlamps were already almost necessary because of the fog. 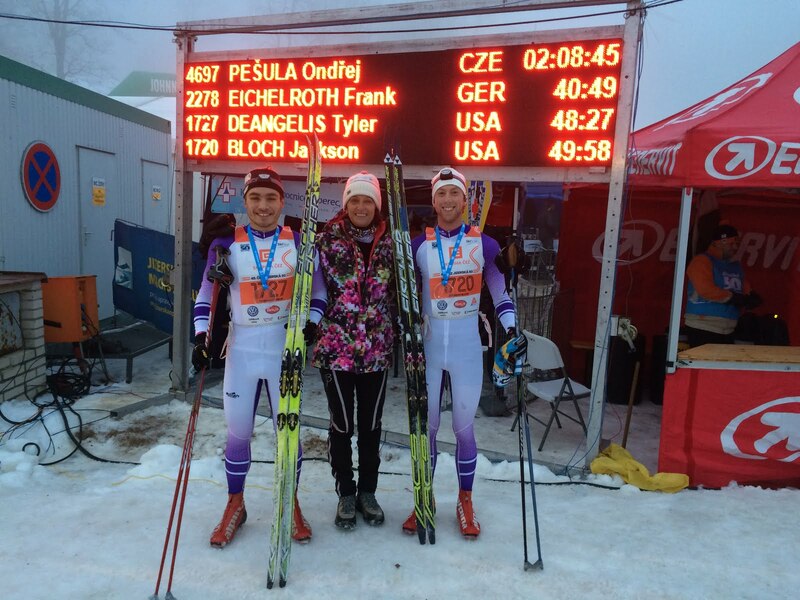 While our race had been changed to a 16km race, the elite skiers were still doing 50km and were skiing 15 laps. A large pack in the elite wave starting lap 8, or lap 14. Who knows, really? The elite race ended around 11 and we still had until 3pm for the start of our race. We joined the masses of other racers in the warming tents where we enjoyed a pre-race meal of bread, nutella, and, you guessed it: shot blocks and gu. The temperatures rose quickly and by the time we were ready to test our skis we knew the wax we had prepared probably wouldn't work (for you wax nuts out there: toko green base binder ironed in followed by four layers of Start Oslo Violet). Regardless, we changed into our race suits and went out. 3. Spend the time that we would have spent warming up and testing wax meticulously spreading (with our thumbs) a thin layer of Rode multigrade violet over the layer of Start wax we already applied. We had learned from watching earlier waves that there is little order at the start and that people begin lining up very early. With 25 minutes to go before the start we found ourselves corralled into the starting block, skis and poles in hand, dressed only our race suits. Our former coaches would have been very proud of our thorough warm up (or cool down, as it was). After a chilling 25 minutes, soul shaking drum beats, and the sound of the gun, we were off! Well, the first row was off. The corral was so packed that only the first row was able to put their skis and poles on before the start and everyone else stood behind them, skis in hand, waiting for more space. As the crowds thinned we sprinted to the side, put on our skis, and started to move through the pack. Tyler breaks the ribbon, first in the wave! Jackson crosses second, close behind. At the finish with Vera, Fabian's mother. All in all, it was a great day, and one of the craziest ski experiences either of us have ever had. We are so grateful for everything the Fabian's family has done for us and are going to miss the Czech Republic. Now we are in Germany, where we are visiting Kara, Tyler's friend from high school. 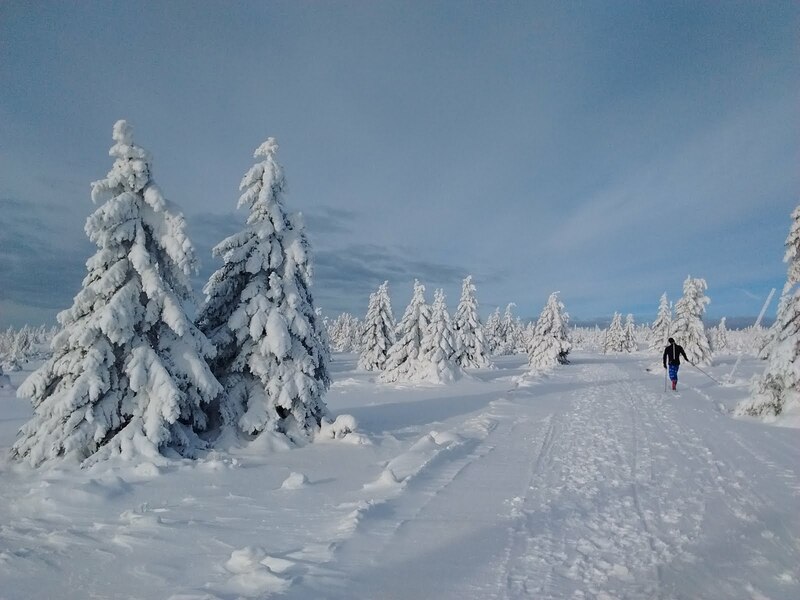 Beautiful ski into Poland! Great pictures of the finish - congratulations! Jackson, this is just so amazing. I must confess to a teary feeling reading through the story and seeing y'all's names on the board. We are looking forward to following you across Europe! Love the unplanned excursion to Poland. Engaging narrative and photos! Your Blog is Fantabulous!!! 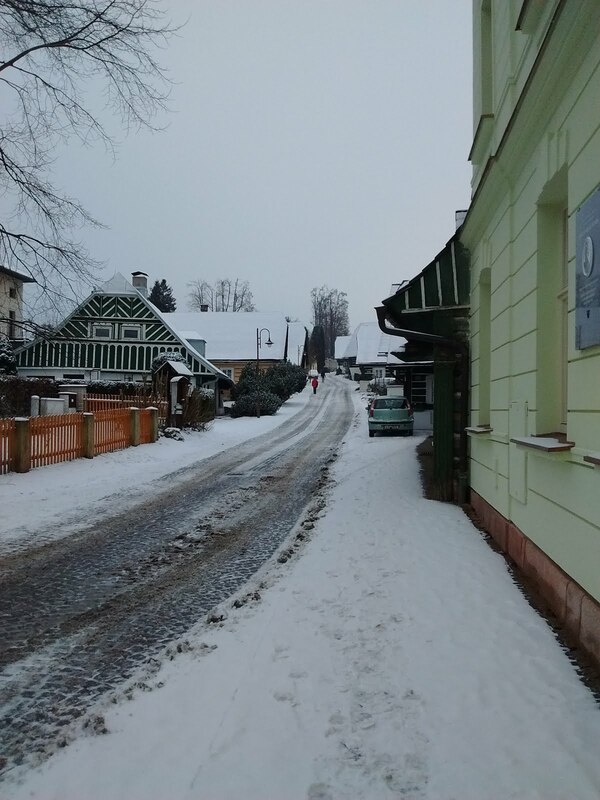 The visuals and narrative are so engaging, and I cannot help but smile big as I read it -- and as I think of your description of the Stocek's hometown, family, landscape, and hospitality, and layer your stories upon our own fond memories with them in Jilmenice and Horni Misecki and the Polish border! I am sure they loved having you visit! I've never followed a blog before, but I have this one "pinned" so your wonderful background photo is my new internet "wallpaper". I'm cheering you on and looking forward to hearing more stories! All the best for your next race! Tyler, glad to see you're putting your GPS watch to good use! And wow! Incredible performance...which surprises me not at all after observing the training regime last summer! Thanks for letting us vicariously enjoy your travels!